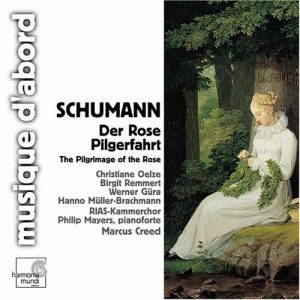 Der Rose Pilgerfahrt (The Pilgrimage of the Rose), a cantata composed by Schumann in 1851 at the beginning of his ultimately unhappy stint in Düsseldorf, is a nice work but it isn’t top-drawer Schumann, dating from a period the general consensus doesn’t see as the composer’s most inspired, and when the first signs of his mental illness were already taking hteir toll. The poem was submitted to him by a poet of only local fame, Moritz Horn, but its fairy-tale imagery and sentimental romanticism flared up the composer’s imagination. The story is of The Rose – perhaps the daughter of the Queen of the elves, or perhaps just a rose – who asks to live the bliss and pangs of human love. Wish granted by mamma, but under the proviso that in the end she will, like a rose, wilt and die. And so she happily does after giving birth to the child she had with the forester’s son. The cantata is very lyrical and has a few ear-catching moments but it lacks both dramatic contrasts and Schumann’s distinctive melodic invention. The interest of this version, recorded in May 1998, is that it is triply “authentic”. First, because it is played with piano, rather than orchestral, accompaniment. 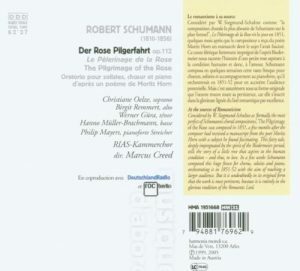 When he composed Der Rose Pilgerfahrt in the spring of 1851, Schumann was very happy with the original piano version, he considered it perfectly suited with the intimacy and delicacy of the subject, and it is only at the behest of friends, and to make it suitable to larger forces, that he orchestrated it, in the fall of the same year; and he considered the task of orchestrating a drudge work, which forced him to return to a work which he had considered complete and behind him. That may be why the orchestral version sounds, to my ears at least, rather bland, much reliant on strings and with little contrast of color from woodwinds and brass. 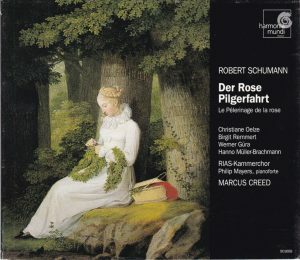 Compared to the classic (and premiere) recording of the orchestral version, conducted by Rafael Frühbeck de Burgos in 1974 for EMI, the piano accompaniment also allows for more dynamism and bounce in the more scherzando passages, and it lets you hear, especially in those moments, much better Schumann’s distinctive compositional style, his typical piano cavalcades, which become blurred in the orchestration. On the other hand, in some of the more pathetic moments (as the funeral procession, track 8, or Rose’s Prayer, track 10), I find the orchestral vesion more effective. Second point of “authenticity”, that the cantata is accompanied here not by a modern grand, as in the premiere recording of the piano version by Rupert Huber and pianist Robert Szidon on ebs in 1990, but by a period forte-piano – a Streicher from 1850, which seems perfectly appropriate. But, as much as it can be admitted that this his probably closer to Schumann’s sound world, I can’t say that I’m an entire fan of period pianos in romantic music, with their more frail and wooden tone that doesn’t sustain basses and songline as well as modern pianos. But ok, this is the kind of sound that the small audience gathered at the premiere in Schumann’s home in July 1851 could hear, and it is no menial consideration. Third element of authenticy and much more important to my ears, unlike his predecessors Frühbeck de Burgos and Huber, Marcus Creed follows exactly the score in the allocation of women’s voices between solo and choir. For instance, the opening number is sung by three solo voices from the chorus – soprano I first, joined by soprano II, then alto. Frühbeck assigned the first two voices to solo soprano and alto, and then had the full women’s choir take over when entered alto. Huber assigned the full number to his choir. Frühbeck wasn’t overly liberal with such reallocations, he did it again only in one of the final choruses, track 20. Huber was more generous with them and practiced them in three more instances. 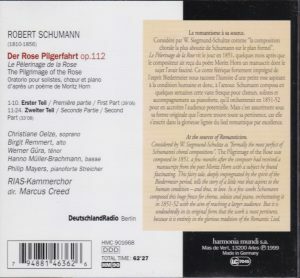 Both choices were okay, none were dramatically inconsistent – those parts aren’t for individualized characters, like the narrator or the Rose, just anonymous solo voices – and they made sense musically: the chamber-size and transparency of Huber’s choir in particular made it work perfectly, and nobody would have raised an issue had Schumann written it either way (in fact one can easily prefer Huber’s choice) – but the point is, he didn’t, and Creed plays it as Schumann wrote it. Creed’s soloists are fine, Werner Güra has a tenor voice one can easily imagine in Schubert’s lieder and Christiane Oelze’s soprano has the youthfulness required by Rose, but they would have been even more enjoyed if it wasn’t for the memory of Frühbeck de Burgos’ two superlative and insurpassable singers, Helen Donath and Theo Altmeyer. But as the gravedigger, Hanno Müller-Brachmann’s basso is particularly impressive – incredible to think that those sounds come from the throat of a (at the time) 28-year old singer. The RIAS Kammerchor sings with fine transparency. Creed’s tempi are overall fine, close to the score’s metronome indications. In the forresters’ song (men’s chorus), track 15, one feels that a touch more animation would have benefited – this is one of Schumann’s typical cavalcades, but as rendered here it feels pretty lazy. Cueing is perfect, one for each of the 24 numbers of the score. A further advantage of Harmonia Mundi’s production over the two competing versions I have in my collection: English and French translations of the poem are provided (in the original issue; I don’t know about the 2005 reissue in Harmonia Mundi’s “Musique d’abord” budget series). There’s a more recent recording of the piano version on Carus Verlag with Christoph Pregardien, Carus 83 450 barcode 4009350834507 (recorded in October 2009, released in 2010) and three with orchestral accompaniment, by Gustav Kuhn on Chandos 9350 barcode 095115935026 (1995), by Christoph Spering on Opus 111 30-190 barcode 709861301904 (1998), and by Spering again on Oehms Classics OC 871 barcode 4260034868717, a live recording from 2013 (paired with Schumann’s Requiem), but I think that, as much as I am an insatiable collector and completist, for what the piece is worth I’ll stop here and move on to other things.